Last month, I was searching through BLOGGING FOR BOOKS looking for a new book to review. As I searched, I came across a book by author MATT HEARD. I knew that name. I knew a Matt Heard when my family and I attended Highroad Bible Church in Lockport, IL. I was a teenager then, and he was our pastor. Was this the same Matt Heard? It had been years since I had heard from him and his wife, Arlene. I looked the name up on Facebook and found someone who looked like the Matt I knew. He was hard to miss with his red hair. Then, from his FB page, I saw a link to his WEBSITE. 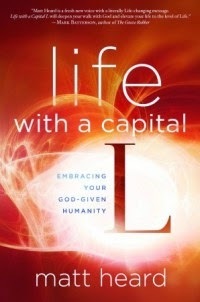 The website talked about a new book, "Life With A Capital L." It was the same book I saw on the Blogging For Books site. So, yes, the Matt Heard who wrote this book is the same Matt Heard I knew as a teen. How fun! So, I snagged a copy of the book, and have been reading it for the past month. Now, to be perfectly honest, I had a hard time getting into this book. Its hard to explain, but I'm guessing its just not the style of writing that I connect best with. I did, however, connect with chapter 4, and believe it to be the heart of the book. In chapter 4, Matt conveys how our notion of "eternal life" usually puts us in Heaven before we are allowed to experience it. Matt explains that, when a person accepts Jesus as Lord and Savior, THAT is when his/her eternal life begins (pp. 44-45). Understanding eternal life in this way is when we can truly experience life here on earth. Matt uses stories, personal experiences, Bible references, paintings, and words from other authors to help him express the ideas in this book. Things like: Life is everywhere. We can find good even in the midst of tragedy. Embracing humanity means going beyond merely existing and actually engaging in life. Our longings define us. Our ultimate longing should be for eternal life. He who does not have the Son of God does not have life (1 John 5:12). To summarize with one short sentence: It is important for us to realize our need for Christ, and to act on it, if we desire to truly experience life here on earth - Life with a capital L.
Thanks goes to Blogging for Books for my review copy of this book. In exchange, I have expressed my opinion.